Ensalada Rusa (“Russian” Potato Salad) is one of our most popular recipes and a favorite in all our party and holiday meals. 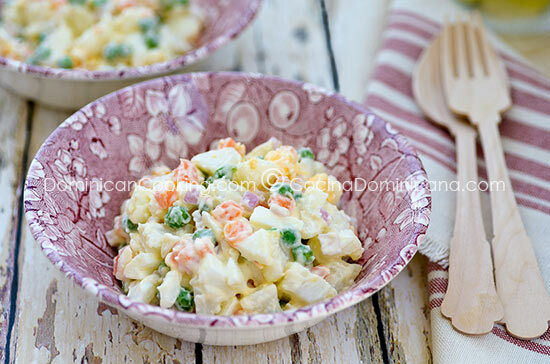 Ensalada Rusa (Russian Salad) in a Dominican blog? Why yes! Practically every country on earth has a version of potato salad, and many also call theirs “Russian salad”, but did you know where Russian salad originated? I bet you won’t guess in a million years. Well, what do you know, it did come from Russia after all! The original “Russian salad” was created by the chef Laurence Olivier who worked at the prestigious Hermitage Restaurant in Moscow at the turn of the 19th Century. The original Olivier salad (as it is known in many countries) did not contain mayo, but a signature dressing that is now lost in time, but almost certainly contained mustard and oil from Provence. The salad also contained beef tongue, cold cuts and lettuce, although it probably changed with the seasons, or availability of ingredients. This is why this dish is known as Salade Olivier in France. In our country it has become what is probably the most popular salad and is always present at all types of occasions. From the informal family reunions to the elaborate Christmas dinner table. From lunch to dinner. Depending on the family’s taste, and on the occasion, different versions of this salad may be served. Two common versions are the one that includes beets and another with apples. This last one is the one usually served for Christmas. Ensalada Rusa Recipe (“Russian” Potato Salad): a Dominican's favorite. It is usually served on special occasions and at Christmas dinner. Boil together the potatoes, carrots and eggs with a teaspoon of salt. Boil the beetroot in a different pot (do not use beetroot if you are going to use apple). Peel potatoes, carrots, eggs, apple (or beetroot) and dice into small cubes. Mix potatoes, carrots, eggs, apple (or beetroot), onion. 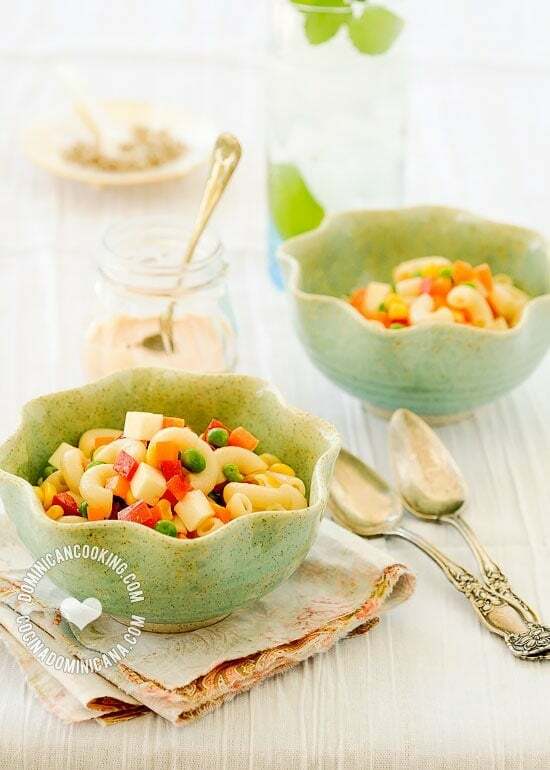 corn and peas. Add mayonnaise and mix. Keep salad chilled at all times until it's time to consume. There are as many varieties of this salad as there are home in the DR. Optional ingredients are added (or not) in some homes. Other options include adding a dash of vinegar, or a pinch of sugar to the salad. Experiment until you find the version you like most. I love this ensalada! I usually always make it with beets and also onions. When making it for a party I have to omit the onions and beets because not everyone likes onions. I think the onions are what make the salad. Anyway, they don’t know what they are missing. Another special tough my dear mother in law would do was to add a 1/2 of teaspoon of apple cider vinegar the veggies mixture together with the boiled eggs to give it a “tang”. I like it with or without. Thanks again for all your great recipes. One of the tricks that my mom taught me for those whop may not like one is to great the onion on a box grater. You get the onion flavor through out the salad, without the chunks of raw onion that some find offensive. Another person added that they add apple cider vinegar to their salad and I would agree it is a must. Deliciosa! I really like the recipes on this page. Is there a specific type of potato you like to use? For instance Yukon gold? Or does it matter? Any potato big enough that it can be diced will work. Yukon is perfect. Stay away from yellow potatoes as they tend to get too mushy in this salad. Why wouldn’t you peel and dice all of the root vegetables first?